Made Possible With MHI Patents On Nanomaterials. Please Click Graphics for Details. 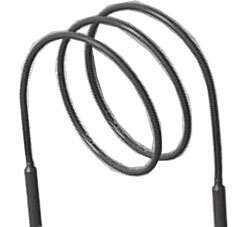 New* MHI Announces GAXP-Ig2MP 1 meter long HotCoilRods™ for use up to 1450C. Three such elements used in a three phase configuration will replace 1m long Silicon Carbide Rods in large furnaces. Plug in to 240V 3 Phase. 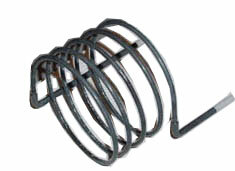 These new HotCoilRods™ will not deteriorate by standard the "aging" process" which causes deterioration in SiC rods. They offer greater power and longer life. More Coils Below: Note that the power shown for the coil is for the free radiation use-mode. Vertical use-configurations and/or stress may reduce the effective use-temperature. 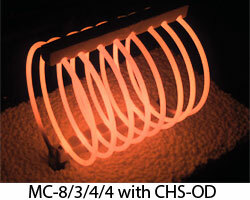 MagnaCoils™ - 1450°C Maximum Surface Temperature of Coil. The objective for the use of free radiating devices is to maximize the radiative POWER transfer from the heating elements. 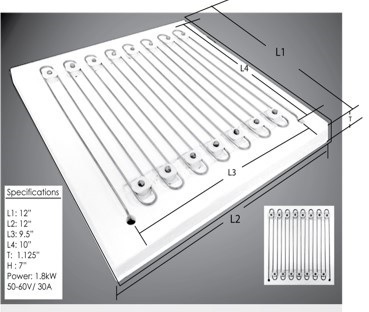 If the heating element is used with insulation the objective of the user changes to obtaining a certain temperature inside the insulated region. 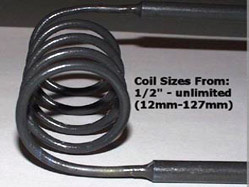 For either objective, one cannot exceed the rated temperature of the heating element (coil). 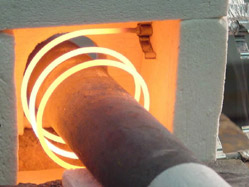 The element use temperature may be further limited by creep and stress conditions including creep-fatigue interactions. Although general guidance on use is given, specific conditions are not known to MHI. Users are cautioned to use appropriate safety factors for the use- temperature rating. If an insulated coil is preferred please see our Robust Radiator™ line of products now available with fiberfree™ high quality refractory enclosure. Please use MHI Power Controls for the best performance. Please use Robust Radiators if using at the limit of performance. 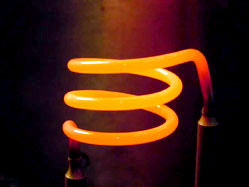 Heating Element Temperatures (1450°C MC-MagnaCoil™ or 1190°C MCA-GAXP or IR)*. Choose from Single Element, Flat or Round Cross-line, Hook, Inline Models or Inplane Terminals. Limitations on use configuations may apply because of coil-creep (movement during use) please Contact MHI. The use of spacers is recommended for vertical use/configurations. 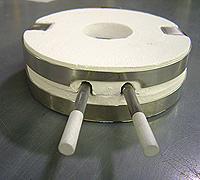 Spacers may not be available for Ultracoils. Click here for pancake shape elements. 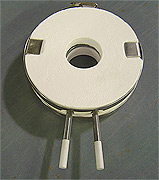 Request a quote for coil elements.